California State Board of Food and Agriculture member Don Cameron at Terranova Ranch in Fresno County. “Water and the California Farmer” is a discussion of water in agriculture – Ag’s share of total water use, and the innovative conservation measures already practiced on farms and ranches around the state. More information may be viewed here. Don Cameron, a member of California’s State Board of Food and Agriculture and general manager of Terranova Ranch, is on the cutting edge of irrigation. His wine grape vineyards stretch for 1,300 acres, so maximizing water is a top priority. Cameron has used drip irrigation on these vineyards since 1982, a time when drip was still uncommon. 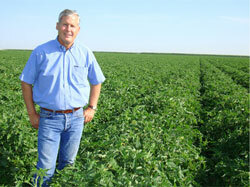 But drip irrigation isn’t the only practice that makes Cameron a pioneer in water use efficiency. During flood periods, which typically occur once every three or four years, he captures flood flows from the Kings River and diverts them to his vineyards to recharge the groundwater supply. Cameron is currently working to expand this practice with a Flood Corridor Grant from the California Department of Water Resources. Terranova Ranch is also receiving bids for a 1-megawatt solar facility that will be built this summer to decrease dependence on conventional power for the farm’s water pumps. Taken together, these practices are a great example of how micro-irrigation coupled with strategic flooding and renewable energy investments can enhance water efficiency and responsible groundwater maintenance. An Ag Water Fact Sheet is available as a quick resource on Ag water use.